It’s time again to take a look at what Marvel comics of interest are coming out. November 2016’s solicitations list is available here. “Civil War II” is apparently finally over… which just means yet another crossover “event” is starting: “Inhumans vs. X-Men.” Which is about, well, the Inhumans versus the X-Men. Wondering if it can really be called an “event” if the massive crossovers are non-stop? Despite its name, “Invincible Iron Man” is actually about its newest character, Riri Williams. She’s a 15-year-old scientific genius and MIT graduate student who’s built her own Iron Man armor. It’s reported Riri’s superhero name will be “Ironheart.” While the name makes me think of a character in a Rankin-Bass special, I’m fine with it. I also would’ve been fine as well with “Iron Woman,” even if Riri’s writer (Brian Michael Bendis) thought it was too old-fashioned. And yes, “Iron Maiden” would’ve been quite the trademark nightmare. Black Panther is getting a second ongoing book starting this month, focusing more on Wakanda. Again, I’m still trying to avoid suggesting $5 books, but apparently Marvel’s determined to make their first issues more expensive than usual. The cover for this month’s “Champions” shows the teenaged, time-displaced Cyclops getting punched by Nova. Unlike a few similar Superman or Flash covers, it probably isn’t a right hook that’ll send Cyclops back to his own time of the 1960s circa 13 or 14 years ago. Squirrel Girl continues her team-up with Ant-Man this month. 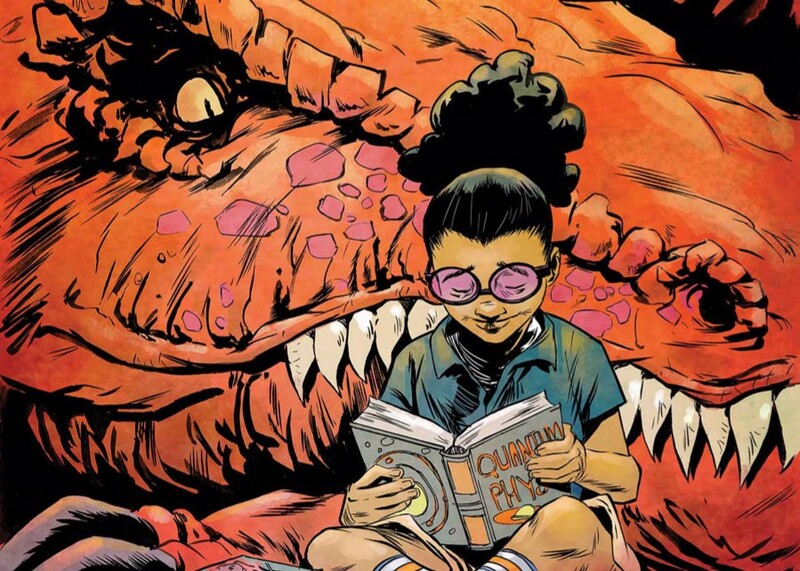 As recently confirmed by Marvel, Lunella Lafayette (aka “Moon Girl”) is the smartest person on Earth (in the Marvel Universe). High praise indeed, given the Marvel Universe is full of geniuses (Tony Stark, Reed Richards, Amadeus Cho, etc. ), but it’s cool that Lunella’s made this big an impact with both readers and her publisher.